Slice ribs pre-cook? + Rotisserie Prime Rib tips? There will be a lot happening at once, so I'd like to get more done during the prep than during and after the cooks. 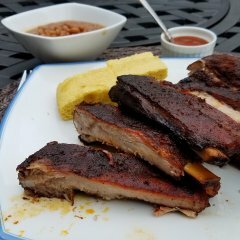 I'm wondering if cutting the ribs into sections--or even individually as this article suggests https://www.smoking-meat.com/august-13-2015-pre-slicing-ribs-before-smoking-them--has been a success for anyone. My thoughts are smoke them for about 2 hours, put them all in an aluminum pan or two with some juice/sauce and rub covered for another 2, then take the top off the pans to finish them off for a bit. After that I can just set the pans out and let people have at it. This works beautifully with beef ribs, but I've never tried it with pork. It sure would save me time and aluminum foil during the cook. It will also keep anyone from grabbing too many and throwing meat away. As far as the prime rib on the rotisserie, I'm planning on lighting a good base of coals topped with hickory logs I have and letting that dwindle down to a hot heap of coals. Should I offset the roast a little with a pan underneath with some water in it to use the juices? If so, I may be able to use our fire pit. I think this will be a 5+ hour process, so I'm sure I'll have to add coals. Since it'll be boneless, do I need to tie it with string or wire, or will the forks suffice? This is going to be an experiment for sure, so I'm glad I'll have the baby back-ups. 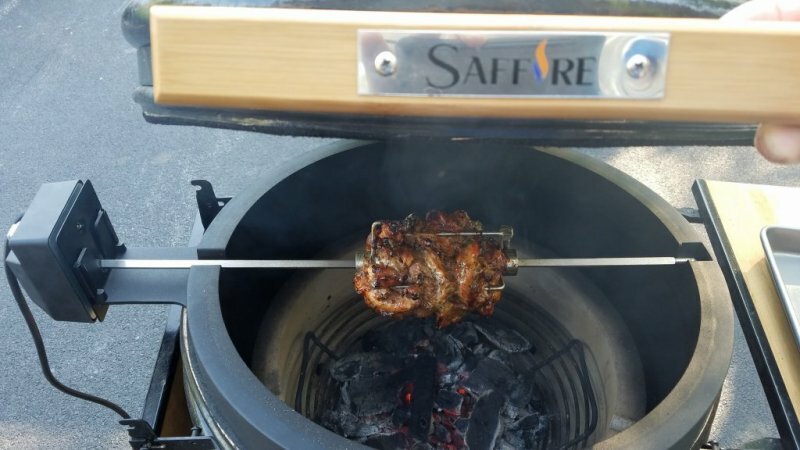 Any open flame rotisserie experts out there? As always, thanks for the help! So, I got my Joetisserie and began to look for a replacement motor in case after a year my motor failed. The joetisserie motor is .model RM-A101, and conveniently enough Onlyfire has the exact same model number motor that looks identical. Here is the link on Amazon for Canada, same item would be for the USA. I ordered by both, and the stainless is going back, it does not match for reasons below. Now this says it's rated for 20lbs and is 4 watts just like the Kamado Joe one except the kamado Joe says 50 lbs. which I find odd. Also the stainless steel one on Amazon is a RM-A201 and the bolt pattern does not .match the Kamado Joe plate if you have to swap plates. The description says it has anti backlash gears. It's not stronger for those looking for more power but this will allow you to swap adaptor plates and have a backup motor in case your motor dies during a spin possibly and this will get you back up and ruunnig. It's cheap insurance. Can't upload photos from where I am but will try later. Oh the joetisserie cord is longer. Had the Joetisserie for a few weeks, just had a chance to use it for the first time yesterday. I have had a Big Joe, BJ, new 2017 model, for about six months, and have run a fair bit of beef and pork through it. Preparing to spin a 6# chicken, following Joe Setzler's video on cooking a chicken on the Joetisserie. Took all the racks out. I tried as best as I could to fit the JT onto the Big Joe. I got it centered on the gasket, thin part toward the back, but the JT was smaller than the Big Joe. I was worried at the time because the JT is smaller than the Big Joe by almost 2 inches! I could barely get the JT on the gasket with an almost 1" gap showing on the gasket. Nonetheless I was committed to spinning the chicken -- family coming over and expecting a smoked chicken. :-) Piled up the lump towards the back, as Joe Setzler suggested. Lit the pile of lump, closed the lid after about 10 minutes or so. Had to close the top and bottom vents almost all the way to stabilize at 325. Dropped in four chunks of apple wood, Let the temp stabilize again, now at 340, probably because the wood was burning. Anyway, put the bird on the spit and the spit in the motor, and set it to spinning. The setup leaked pretty bad. Wood smoke coming out, mainly around the left side of the JT. But smoke was *really* pouring out of the opening where the motor-side of the spit goes into the JT. Temp shot up once to near 400, probably because of the wood still burning. Got the temp down to about 350. Bird was done at 90 minutes, wowed the crowd. But this smoke emerging from the gap worries me. The 2" difference in size is just too great. BTW. Didn't have look at the BJ until today. Temperature was still at 210. I can't escape the conclusion that the JT is just too small for the Big Joe. What now? Had a small pork loin in the freezer from my BIL's pig. Watching John Setzlers video on spinning a pork loin, plus a recent post on the Facebook group made me decide to dig the Joetisserie out again. Injected it with applesauce/apple juice mixture, slathered in mustard and coated with my wife's cajun spice rub. After about an hour and 15 minutes of spinning at 325 degrees, we pulled it off and left rest for 10 minutes. 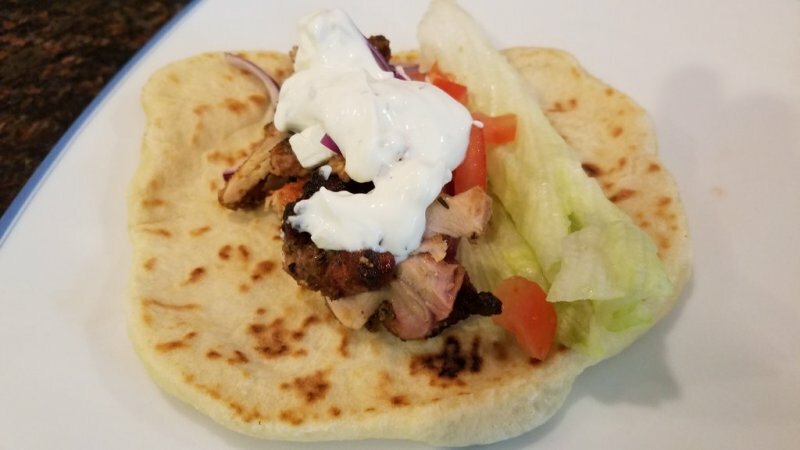 My wife thought I was going to break into tears with my first bite. Words fail me to describe it. The subtle flame kissed outside, the juicy inside, so soft you could cut it with a fork! You can't buy food this good at a restaurant (at least not a restaurant I can afford). Thanks again John for your excellent video.